The northern part of the Bulgarian seacoast is famous for its virgin nature and picturesque coastal towns. Here we’ve put together a list of some of the most interesting landmarks you can visit. The Northern and South regions of the Black Sea Coast has a lot to offer in terms of luxurious resorts, hotels and apartments, and villas with pool for rent. And if that is not a good enough reason to visit, the regions also offer an extensive amount of landmarks that capture the eye of most tourists. Here we have an article about Bulgarian Black Sea South Coast. An important feature of the Northern part of the Bulgarian coast is the exquisite nature. The rare and diversified natural sites are really some of Bulgaria’s greatest treasures and thus most of the landmarks in the list are part of different nature and wildlife sanctuaries. 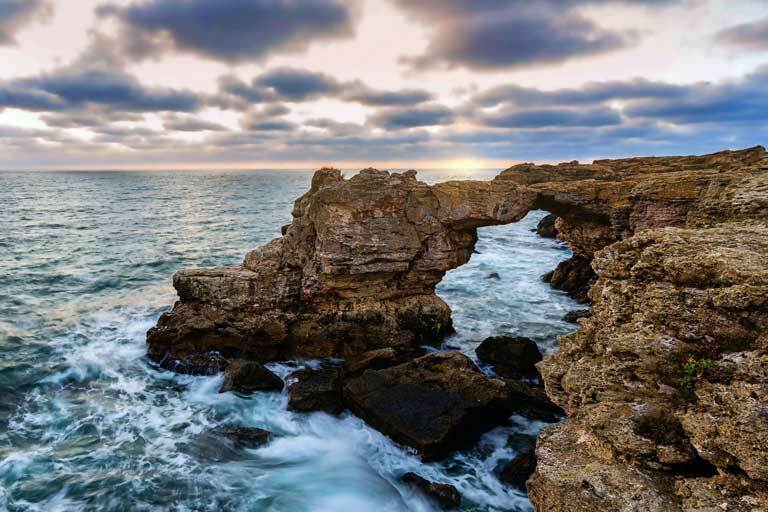 Cape Kaliakra is not only one of the most wondrous capes in entire Europe but it also has a really long history dating back to Thracian, Roman and Byzantine times. In fact, even the name of the cape origins from Byzantine times and means “Beautiful Fortress”. There are numerous stories about that staggering place, but probably the most famous and significant one is the one about a group of 40 Bulgarian girls who jumped from the fortress down to the cliffs and met certain death. The legend explains that the girls decided to give away their life in order to escape the Ottomans who were going to capture them and force them to accept Islam as their new religion. Nowadays there is an obelisk that commemorates that event. It is known as “The gate of the 40 maidens”. Legends are not the only evidence we have of the century-long history of the cape. The Kaliakra fortress features remnants of fortifications, walls, baths, and the residences of medieval rulers. Aside from being a well-known historical site Cape Kaliakra is also a nature reserve for dolphins and cormorants. For the birdwatchers, Kaliakra is a preferred place since some of the most intriguing migrant bird species visit the cape of their way to all parts of Europe and some are permanent residents of the wildlife sanctuary. 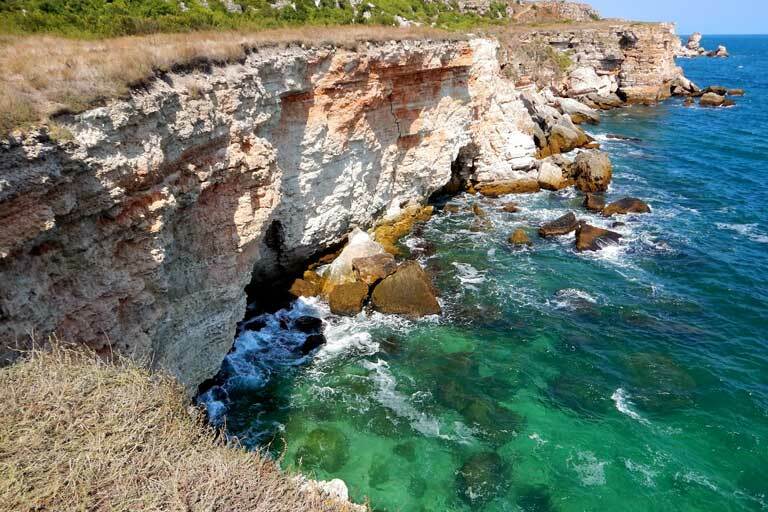 Overall, Kaliakra is an outstanding place, packed with both rich history and breathtaking sites. Balchik is a famous coastal town and a resort in the northern part of the Bulgarian coast. Balchik first emerged back in Thracian times as a settlement and developed further and further through time. But possibly the greatest change came to the town when it was under Romanian administration. The whole idea may seem bizarre but the town, as well as many other territories, was part of Romania for a while after the Second Balkan War. Later on, Bulgaria regained its control over those territories. But that short period of time, when Balchik was Romanian premises, really helped shape the look of the coastal town nowadays. It all starts with Queen Marie of Romania who fell in love with the city. And soon afterward in the small coastal town a Palace was built. Nowadays it is known as Balchik Palace and is one of the main tourist attractions there. The palace itself is out of the ordinary because it embodies different architecture types including Balkan and Ottoman motives. Numerous buildings are scattered all around the premises including a wine cellar, monastery, power station, a chapel, a holy spring and much more. Right around the beautiful palace is situated another of queen Maries creations. The impressive park of the palace that nowadays is turned into a botanical garden. There is nothing that can compare to walking down the numerous alleys in the park and enjoying the beautiful architecture of the Palace and all adjacent buildings. Fun fact is that Queen Marie loved this place so much, that she wanted to have her heart buried in the park of her palace. Once you gaze upon the breathtaking sea panorama of the Palace you are guaranteed to fall in love with the place just as much as the queen did. The reserve is located Kavarna municipality and is best reached by car. Yailata was declared an architecture sanctuary because of the numerous archeological findings in the area that date back to Roman, Byzantine and even Thracian times. There is no other place like the northern seacoast of Bulgaria, that has been influenced by so many and so diverse civilizations. But some of the finding in the reserve date back even further in time. There were traces of settlements and life that dated back to the astonishing 5 000 years BC. All across the sanctuary are scattered numerous artifacts such as shrines, sacrificial stones, necropolises, tombs, and cave homes. All of these findings are unique and are a treasure not only to Bulgaria but to the world. There are very few places that can take pride in such amazing findings. Naturally, there are different findings from later times like the 5-6th century and the middle ages of Bulgarian history. All of these amazing things are waiting for you to locate and explore them in the sanctuary. But Yailata is not only an architecture reserve. Nature there is just as special as the findings in the area. There are numerous different species of the flora and fauna that have found a suitable home in the reserve. Most of them are endangered species. So it would be nice of you to do no harm to the interesting and unusual species as you take hikes in the divine nature. There are more than 250 different types of plants and animals that live in harmony in the sanctuary. The reserve is a nesting place for over 200 different bird species so there will actually be a lot of wildlife for you to enjoy. Tyulenovo means “seal village”. You will probably wonder how such animals emerged in Bulgaria. Well, there is an interesting story to that. The very same queen Marie who built the Balchik Palace was gifted a couple of seals. Once she decided to let them go to freedom and they found their new home in the numerous caves near the village that is now named after them. Nowadays you are probably not going to see any seals in the region but you may enjoy the rocky coast that is a favorite spot to many scuba divers. What this place really has to offer may not appeal to some, since there are literally no sandy beaches or sunbathing areas. All you can find here are rocks, caves, underwater caves and numerous things to explore. If you are a sucker for the adrenalin rush and dangerous activities than you will probably love the place. You can go rock climbing and explore the diverse nature in the region, or go scuba diving in those caves and enjoy the interesting and mesmerizing sea wildlife. Another favorite activity is jumping from the rocks straight down to the water and then climbing back up for a quick rest on the rocky earth and going in for another jump and a swim. Many historians believe that the lighthouse in Shabla is a smaller copy of the famous Alexandrian lighthouse. And there is actually a striking resemblance. But even if this is not the case the lighthouse in Shabla is still quite famous. This is the oldest lighthouse in Bulgaria and on the entire coast of the Black Sea in general. It was built all the way back in 1856 while Bulgaria was still part of the Ottoman empire. But that is not the only record that the lighthouse holds. It is also the tallest one in the country and is located on the easternmost point of Bulgaria. And if all those special reasons to go and check it out are not enough, here is one more: visiting the lighthouse will be the perfect ending of a hike near the town of Shabla or a walk down the pristine clean waters of the seaside. Make sure you visit in the evening so you can actually see the lighthouse in action. Euxinograd can best be described as a summer palace or residence that was built in the 19 century. It is considered one of the finest examples of Bulgarian architecture. The palace was constructed during the reign of Tsar Ferdinand and is designed to resemble a French chateau. Although the palace is used as a presidential retreat its possible for tourists to come and visit the outstanding gardens and enjoy the beautiful examples of architecture. In order to visit the place, you need to book a date for the trip and a tour guide that will lead you through the gardens are available areas. If it is so hard to get there is it even worth it? Indeed it is! The giant park is home of over 300 different plant species from all over the world. Some of them are said to have been selected but Ferdinand himself. The park area stretches over 550 acres. There are numerous interesting species to be observed and a lot of interesting key events from Bulgarian history that took place on that spot. 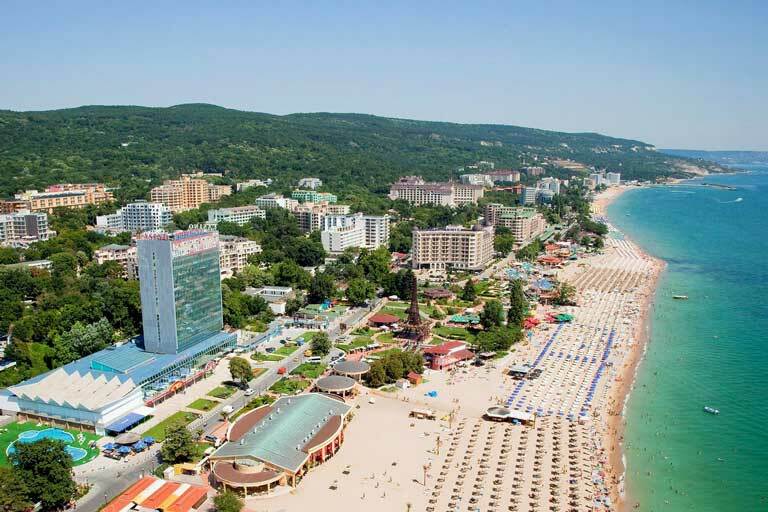 Golden Sands is one of the oldest and most important Bulgarian seaside resorts. As you can probably tell by the name it is famous for the golden fine glittering sand of the beaches in the resort. 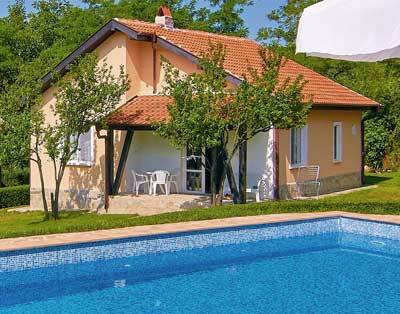 Most of you have already probably booked their holiday in a rental villa with swimming pool near Burgas. But if you haven’t – Golden Sands offers numerous accommodation options. What really makes this resort stand out is the fact that is pollution free and really suitable for family vacations. The beaches are the main attraction there thought. With the glittering golden sand and the pristine, crystal clear water. This is the place you want to go for a swim and sunbathing. But Golden Sands is also a nature park. It has been declared as an area designed for protecting and preserving the flora, fauna and outstanding landscapes in the region. So if you prefer you can take a hike in nature and enjoy the relaxation that it provides. Yet another sanctuary that we would like to present is the Kamchia wildlife reserve. The reserve is situated about 25 km’s south of Varna and is one of the biggest and most beautiful on the Bulgarian seaside. Tourists can both take hikes in the forests or have a boat trip down the river Kamchia, that crosses the reserve. In case you are adventurous enough and decide to take a hike you should never forget that you should follow the marked paths only and not strain in different directions. It could be quite dangerous to get lost in the area. So keeping up with the designated hiking routes is of great importance. The intriguing mixture of forest wildlife and beautiful sceneries makes up for a good opportunity to take a long float with a boat down Kamchia river and explore the interesting sites it has to offer. A bit of small advice you anyone willing to explore the river lands – bring a mosquito repellent with you! Kamchia reserve is home to over 500 species of plants, animals, trees, fishes, and birds. Some of the species there are on the verge of extinction so it would be highly appreciated if you treat nature with respect. The next landmark has recently made its name famous as one of the most beautiful bays in the entire world. Bolata Bay is an extremely popular destination, but it gets really packed up with people only on weekends. So if you consider visiting this breathtaking place, do it during the week. Once again you should really keep in mind the fact that the road that leads you there is bumpy, not maintained and an overall nightmare. But that is one of the side effects of virgin, untouched nature. No matter how scary the way there sounds, you really should gather the courage and check the place out. It is perfect for anyone. If you are looking for a quiet and calm day on the beach, you are guaranteed to get your well-deserved rest here. If you have come with your family, you would be pleased to find out that the water here, as well as being as clear as you can imagine, is also really shallow, which makes it the perfect place to take your children. An important reminder is to take your umbrellas and beach towels with you since there are no facilities on the premises at all. There is also no lifeguard and places to grab a portion of food or a drink. If you want to enjoy the day at Bolata Bay do bring some water and snacks for you and your companions and don’t forget to take photos of the astonishing nature that surrounds you. Lastly, we introduce you to an experience unlike any other. Fanagoriya is a historical and ethnographic complex that is designed to look just like an actual and functioning ancient Bulgarian village. We are not talking about medieval, we are talking about the typical Bulgarian village in the early years after the creating of the Bulgarian country (681 A.C). This is an outdoors complex that offers numerous different activities such as horseback riding and shooting with a bow and arrows. The complex resembles a Bulgarian battle fortification typical for the time period between the 6th and the 8th century. It is surrounded by wooden walls and battle towers. Inside the complex is an exhibition of typical Bulgarian yurts (homes, that are kind of like tents), classic Bulgarian crafts, typical clothing suitable for the period and even weapons and armor. On the square of the complex are towering the ancient Bulgarian shrine and the yurts of the khan and the great shaman of the tribe. Visitors can hire a tour Gide that will help them really submerge into the atmosphere and experience ancient Bulgarian way of living to the maximum. There is also a shop that offers special souvenirs that are replicas of some of the most important and interesting ancient objects in the exhibitions. You sure have heard about Sunny Beach and Golden Sands, two of the most famous Bulgarian resorts and their amazing beaches. But it turns out that in Bulgaria you can enjoy some of the most beautiful, unspoiled, pristine beaches in the world. They are perfect if you want to enjoy a peaceful day at the beach. One of the most important parts in organizing any holiday is arranging the traveling process. It is doubtless that a good initial travel experience sets the tone for the entire vacation. So you better make sure the choices you make provide you with a great journey. The Northern and South regions of the Black Sea Coast has a lot to offer in terms of luxurious resorts, hotels and apartments, and villas with pool for rent. And if that is not a good enough reason to visit, the regions also offer an extensive amount of landmarks that capture the eye of most tourists. An important feature of the Northern part of the Bulgarian coast is the exquisite nature. The rare and diversified natural sites are really some of Bulgaria’s greatest treasures and thus most of the landmarks in the list are part of different nature and wildlife sanctuaries.